December 3, 2018…….Dr. Jeremiah McClure has recommended another article. 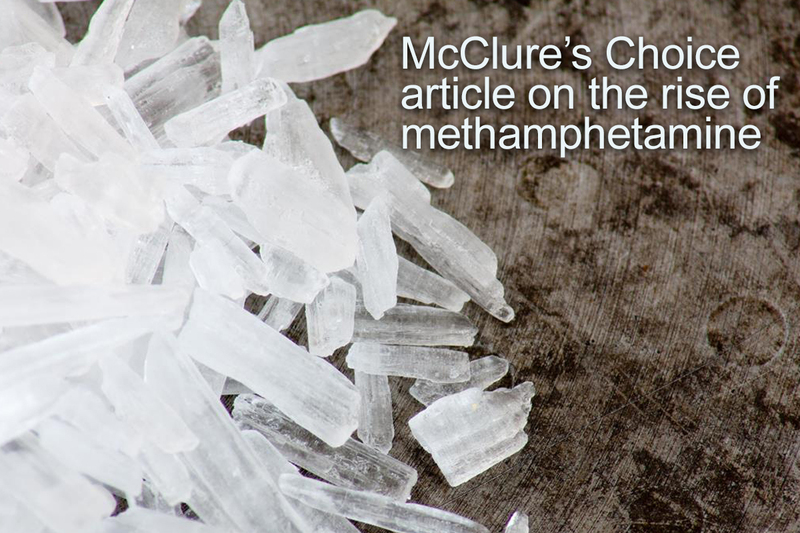 Check out this article about methamphetamine…. The text of the article is here…. Amphetamine-related hospitalizations jumped by about 245% during 2008-2015, according to a recent study in the Journal of the American Medical Association. That dwarfs the rise in hospitalizations from other drugs, such as opioids, which were up by about 46%. The most significant increases were in Western states. Doctors see evidence of the drug’s comeback in emergency departments, where patients arrive agitated, paranoid, and aggressive. Paramedics and police officers see it on the streets, where suspects’ heart rates are so high that they need to be taken to the hospital for medical clearance before being booked into jail. And medical examiners see it in the morgue, where in a few states, such as Texas and Colorado, overdoses from meth have surpassed those from the opioid heroin. Amphetamines are stimulant drugs, which are legally prescribed to treat ADHD and produced illegally as methamphetamine. Most of the hospitalizations in the study are believed to be from methamphetamine use. Lupita Ruiz, 25, started using methamphetamine in her late teens but said she has been clean for about 2 years. When she was using, she said, her heart beat fast, she would stay up all night, and she would forget to eat. Ms. Ruiz, who lives in Spokane, Wash., said she was taken to the hospital twice after having mental breakdowns related to methamphetamine use, including a month-long stay in the psychiatric ward in 2016. One time, Ms. Ruiz said, she yelled at and kicked police officers after they responded to a call to her apartment. Another time, she started walking on the freeway but doesn’t remember why. In California, the number of amphetamine-related overdose deaths rose by 127% from 456 in 2008 to 1,036 in 2013. During that same time, the number of opioid-related overdose deaths rose by 8.4% from 1,784 to 1,934, according to the most recent data from the state Department of Public Health. Dr. Trivedi said many psychiatric patients also are meth users. Some act so dangerously that they require sedation or restraints. He often sees people who have been using the drug for a long time and are dealing with the downstream consequences. Jon E. Lopey, the sheriff-coroner of Siskiyou County in rural Northern California, said his officers frequently encounter meth users who are prone to violence and in the midst of what appear to be psychotic episodes. Many are emaciated and have missing teeth, dilated pupils, and a tendency to pick at their skin because of a sensation of something beneath it. Nationwide, amphetamine-related hospitalizations were primarily from mental health or cardiovascular complications of the drug use, the JAMA study found. About half of the amphetamine hospitalizations also involved at least one other drug. Because there has been so much attention on opioids, “we have not been properly keeping tabs on other substance use trends as robustly as we should,” said study author Tyler Winkelman, MD, a physician at Hennepin Healthcare in Minneapolis. Sometimes doctors have trouble distinguishing symptoms of methamphetamine intoxication and underlying mental health conditions, said Erik Anderson, MD, an ED physician at Highland Hospital in Oakland, Calif. Patients also may be homeless and using other drugs alongside the methamphetamine. The opioid epidemic, which resulted in about 49,000overdose deaths last year, recently prompted bipartisan federal legislation to improve access to recovery, expand coverage to treatment, and combat drugs coming across the border. There hasn’t been a similar recent legislative focus on methamphetamine or other drugs. And there simply aren’t enough resources devoted to amphetamine addiction to reduce the hospitalizations and deaths, said Dr. Maxwell. The number of residential treatment facilities, for example, has continued to decline, she said. Kaiser Health News is a nonprofit national health policy news service. It is an editorially independent program of the Henry J. Kaiser Family Foundation that is not affiliated with Kaiser Permanente. KHN’s coverage in California is supported in part by Blue Shield of California Foundation.